We went grocery shopping at 1 Utama yesterday, and my entire body still hurts from the experience, but I woke up this morning with my heart set on making... pickles! 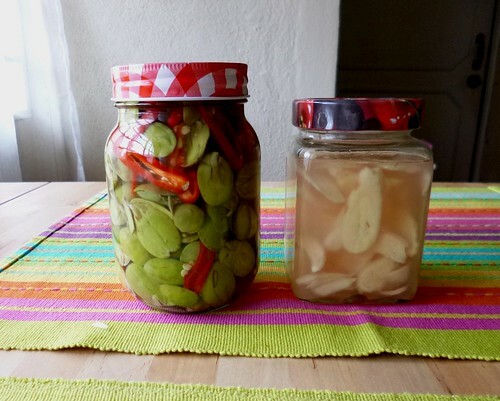 To be exact, petai (stinky bean) and gari (ginger) pickles. Here's the result! Find out how to make these after the jump! Both pickles are really simple to make, but first, let's tackle the petai a.k.a. stinky bean. I just happen to love anything that smells or tastes strong. All my friends don't understand why I love petai so much. Sometimes it puzzles me too. Growing up in JB, you could say I'm a typical city girl, but I definitely have a taste for strong flavours, not sure how that developed. 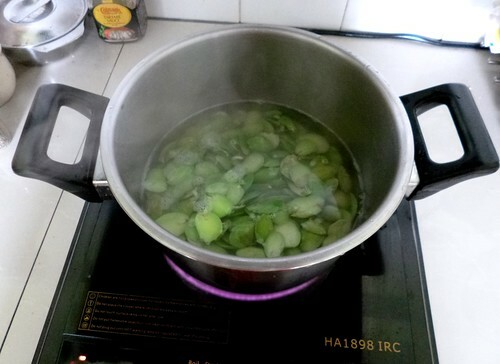 Then I boil the petai for about 5 minutes. Once done, I spoon them into a sterilised jar (I just rinse the jar in boiling water). After that, I cover the beans with hot water and about 1 tablespoon of salt. Today, I added chopped red chillies, but preferably, you should use cili padi (bird's eye chillies). 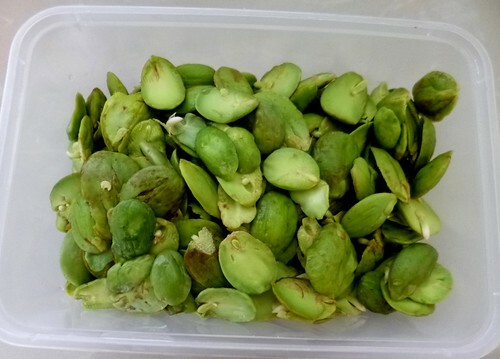 Now, I have a jar of petai ready in the fridge, to serve as ulam with sambal belacan, or to make sambal tumis petai. Yum! This batch will also last a lot longer than they normally would, so I save money! Next, the gari. I grab myself some young ginger and slice them as thinly as possible. 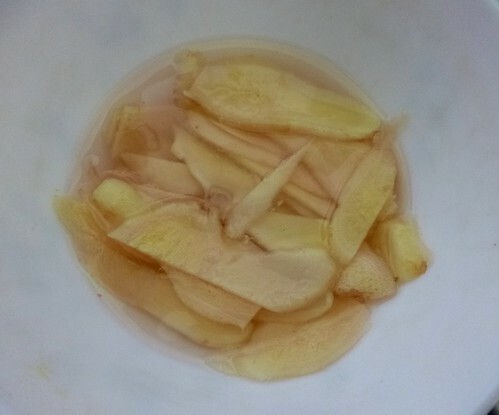 Then, I soak the ginger in hot water, vinegar, sugar and some salt. How much vinegar and sugar you use depends on the amount of ginger you have, so adjust to taste. 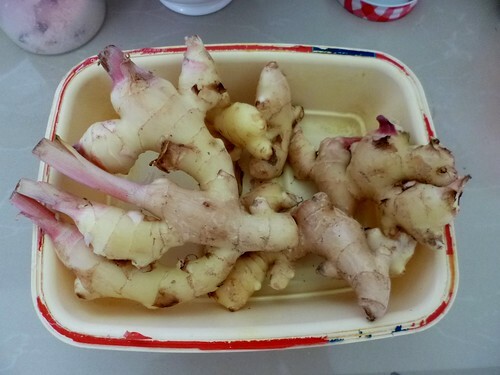 I put it all into a sterilised jar and let the ginger stand for a week in the fridge. Then it's ready to eat! By the way, I didn't wait long to put my petai to good use! 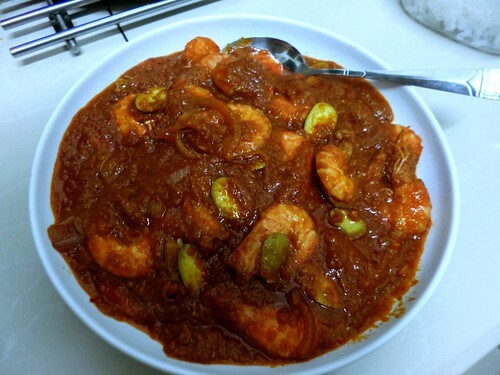 Made sambal udang petai for dinner! Yum! Will share the recipe soon.